The smartest auto shoppers know their car loan value before they begin searching for a vehicle. When you shop for a car first, you run the risk of taking a loan value you cannot truly afford. Just as homeowners seek mortgage pre-approval, car owners should seek auto loan pre-approval to gain insight into their true budget. Your credit score is a key factor in the size and expense of the loan you will receive. Most traditional lenders, including banks, will require a high score of at least 700 in order to qualify you for a low-cost auto loan. If your score is lower than this, you will have to consider your options. One option is to wait to purchase a car until your score improves. This can mean a waiting period of one to two years, depending on the reasons for your bad credit. You may also seek alternative lending options if you cannot wait. For example, auto manufacturers often finance the purchase of their vehicles. These lenders will work with lower credit borrowers, but the terms of the loan may be less favorable. If your credit is high enough to proceed with either a traditional or alternative loan, you will need to start considering a budget. Instead of focusing on the price of a car you would like to purchase, think about how much you can spend on your car loan each month. The sum of all your debts, including your credit cards, student debts and rent or mortgage, should never exceed one half of your monthly income. Remember: you will have to purchase car insurance if you do not yet have any. This can greatly increase the cost of ownership, so it is best to stay on the low side of the budget if you are unsure what you can afford. Vehicle trade-ins are the most common source of down payment on a new car. If you are selling a car, start by researching its approximate value. You can review the Kelly Blue Book and National Auto Dealers Association prices. Then, approach a few used car dealers to get an estimate. This will help you keep the dealer you work with honest when you receive a vehicle quote. Whether you are trading in a car or paying a cash down payment, aim to pay at least 5 percent down on the new vehicle. With your down payment and monthly budget in mind, you can begin shopping for a loan. Approach a few lenders, telling them your parameters. The lender will adjust terms, such as the length of the loan, in order to meet your monthly payment goals. For a shorter loan, your interest will generally be lower but your monthly payments higher. This means you may need a lower loan limit. 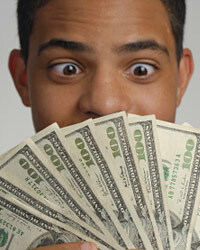 Longer loans can provide you with higher limits without adding much to your monthly payment. However, the interest rates and financing costs of long loans will be higher.